Losing a tooth impacts both your appearance and the health of your smile. In order to once again enjoy a whole and healthy smile, you need to seek a replacement option. 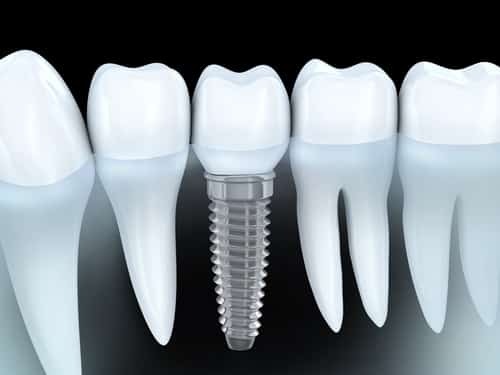 We often recommend dental implants to replace one or more missing teeth. What are the benefits of dental implants? How does this tooth replacement option differ from bridges or dentures? How Do They Differ From Other Tooth Replacement Options? Dental bridges and dentures are common alternatives for replacing missing teeth. They typically only replace the visible parts of the tooth. However, dental implants actually replace the root as well, which stimulates jawbone growth and helps secure them like natural teeth. First, the biocompatible titanium post is surgically placed, where the post bonds with the jawbone tissue. After the area heals, an abutment is added that holds the new restoration in place. Security: The teeth are held in place with an implant that acts as a root. This means the new tooth is more secure than other options and is comparable to a natural tooth. Long lasting replacement: These can last for a lifetime, 25 years and more on average. Bridges last between 10 and 15 years and dentures need adjustment or replacement every 5-10 years. Lifelike appearance: The restorations are made from porcelain, which means they may look completely natural and blend with the smile. Simple care and maintenance: You care for the new teeth as you would your natural ones, which means brushing and flossing daily and seeing your dentist for routine cleanings. You don’t need to soak them or perform special tasks to keep them in shape.